I had no idea I was sitting next to an Argentine rock legend at wine school… until I did. My fellow student at sommelier school, Pedro, is inquisitive and interested in class. Although he is sometimes absent from Geography II or Spirits and Aguardientes, he makes up for it with plenty of searching questions for our teachers, then keenly typing up answers on his iPad. Pedro Aznar is studying to be a sommelier with me, Mel and Valeria the lawyers, Angie from Florería Atlántico (ranked 35 in the world this past Thursday by 50 Best Bars) and Nazareno from Pony Line among others at CAVE wine and spirits school. For many, Pedro is a household name but given my slim knowledge on Argentine rock legends, I had no idea that he played in Charly García’s band Serú Girán, or indeed any other of his substantial musical achievements (some 40 albums released in a 30-year career). Still, at school, we’re all on the same page, cramming for exams and trying to remember grapes pertinent to Alsace and Bordeaux (Riesling and Merlot). So why is this legendary musician putting himself through a two-year course wine school? He talks to the Herald about his passion for the sacred grape in an exclusive interview. Pedro says: “It started with other people’s passion for making wine — I like drinking it and my palate had started to improve, so I started to note the infinite world of flavours. That led to my going to more tastings and talks held by sommeliers, so I became interested in the world of sommellerie. 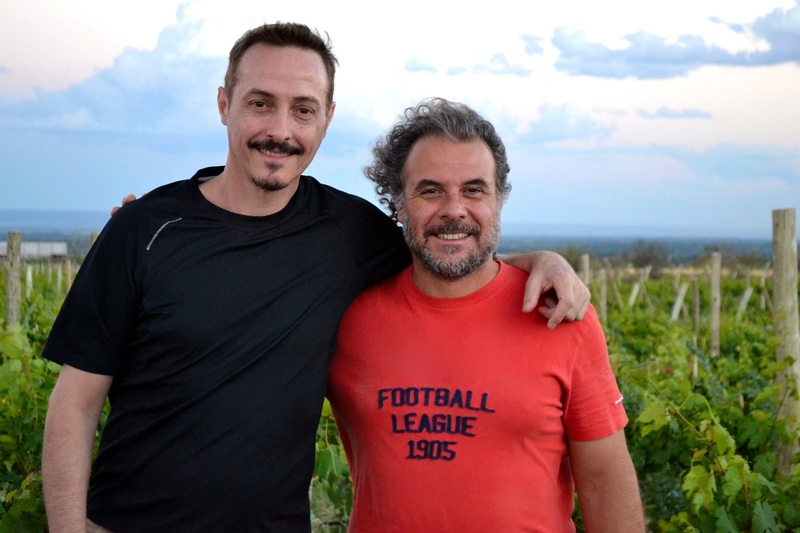 After immersing myself in that, I ended up meeting Marcelo Pelleriti, the enologist who is now my business partner. Besides finding “an extraordinary enologist” in Marcelo, in his words, it is the personal touch that has bonded the two men to a new project. Pedro says: “He is also a very warm and generous person and I felt very accompanied and comfortable entering the world of wine. In this past year and a bit since we met, he’s introduced me to countless other enologists, and I really liked what I found in the human landscape, besides the breath-taking landscapes of Mendoza. He has shared his secrets, which means they obviously aren’t secrets, and there is also isn’t any professional jealousy among all these wine-makers — the philosophy is that if Argentine wine is going well, it’s going well for everyone. I think that’s notable and touching. Besides blending the contents of a barrel, 225 litres of wine, the sommelier-in-training and the enologist have a much larger-scale project in the pipeline. First, they will bottle then sell 300 bottles of their blend under their joint winery venture, Abremundos. But then they will plant 11 varieties on those two hectares in Valle de Uco over the next few weeks, although they won’t be sticking just to classic grapes such as Malbec and Merlot. While there’s plenty of manual labour ahead, the immediate plan is to unveil their first wine — in Mendoza on November 25 and in Buenos Aires on November 27 at Aldo’s Restorán & Vinoteca. You heard it here first. As for those crosses against his name on the school register, he’s got a legitimate excuse for not turning up. Pedro’s been on tour, of course.